The Allied practice of using fighter bombers to actively suppress or destroy hostile anti-aircraft defences dates back to the latter phases of World War II, when USAAF P38s, P-51s and RAF Typhoons carried out gun and rocket attacks on Luftwaffe AAA sites. The electromagnetically benign Korean War saw little change in this area of combat, though in its aftermath the idea of the dedicated radar killing Anti Radiation Missile (ARM) emerged. The USN Naval Weapons Center at China Lake created the first ARM by fitting an experimental seeker, warhead and fuse to the new AIM-7 Sparrow airframe. The mid 1950s test program led to production orders for the Texas Instruments AGM-45A Shrike, second sourced by Sperry, quietly initiating a new family of weapons. The emergence of the radar guided Surface to Air Missile (SAM) as the primary air defence weapon of the Communist Bloc and its subsequent mass deployment in South-East Asia had a significant impact on Allied air defence penetration techniques. For any bombing campaign to be effective aircraft losses must be kept low, 3 percent is bad and 5 percent is disastrous. The SAM if launched in sufficient numbers could be quite effective and airborne jammers were only a partial answer with a major penalty in payload/range and cost. The use of aircraft to directly attack radar transmitters was thus seen as highly cost effective and the technique came into use during the Rolling Thunder bombing campaign. Both USAF TAC and the USN directed their attention to the North Vietnamese surveillance and SAM targeting radars and both established defence suppression philosophies which persist to this day. The Navy hung its Shrikes off general purpose attack platforms, initially the A-4 and A-6, designating the role as Iron Hand. The Air Force sought specialised aircraft, initially a handful of two seater F-100F Huns and designated these as Wild Weasel I. The immature Shrike did not perform well, initial Sperry-built rounds (TI ran into production problems) had low sensitivity receivers in their seekers and had to be launched unguided at the targets locking on when within seeker lock-on range. Many thus went off target, many locked on outside of the missile airframe's manoeuvre envelope and failed to hit. China Lake tweaked up the receiver gain and eventually ironed out these and other bugs, Shrikes then being supplied as pretuned to particular classes of radar. Tactical Air Command also met with difficulties, the F-100F had limited performance and time on station, its armament of 2.75 inch rockets, 20mm guns and bombs necessitating close in low level strikes on the targeted Fan Song/SA-2 installations. By late 1965 TAC pressed its fast and long-legged F-1 05D Thuds into the role but quickly replaced the single seat D model with the two seat F. The F-105F was stretched and had a larger tail surface, it retained the impressive low level speed of the basic airframe. It carried the Litton/Antekna AN/AYH-1 Radar Homing And Warning System (RHAW) upgraded with a Litton recorder. By 1967 the rules of the game were refined, the Communists soon learned that turning a radar off after a Shrike launch deprived the missile of a target to home in on. The Navy's short term measures included the launching of 5" Zuni rockets to simulate Shrikes, if the radar powered up it got hit with the real thing. A major step was the rushed development from 1966 on of the Naval Weapons Center/General Dynamics AGM-78 Standard ARM derived from the RIM-66A shipboard SAM airframe that is used by the RAN. The rocket motor was modified and a TI Shrike seeker was fitted, Standard had longer legs and more payload than Shrike. Its nicest feature was its preprogrammable guidance, the launch aircraft's Target Identification & Acquisition System would feed the target's location into the missile before launch and the missile would use its receiver only to update and improve accuracy. Standard will turn toward a target if launched off line of sight and will hit even if the transmitter does go down albeit with some loss in accuracy. The Navy fitted Standard to its EA-6A electronic warfare platforms, while TAC upgraded its F-1 05F force into F-1 05G Wild Weasel configuration. The F-1 05G had a dedicated aft station for the electronic warfare officer (EWO or Bear) and carried the digital ALR-46 RHAW system coupled with a Litton APR-35 receiver system to target Standard. The Litton/Dalmo Victor ALR-46 could process 16 emitters (eg. radars), prioritise them and feed the data into other subsystems including jammers. Externally the F-105G sported numerous dielectric panels and an elongated blister on either side of the lower fuselage. The Shrike and Standard firing F-105Gs were quite successful though the effectiveness of the A model Standard was limited. It was supplanted by the AGM-78B with a Maxson Electronics seeker from 1968 onward. The limited number of F-105F airframes and continuing attrition prompted TAC to look at alternatives to bolster the Weasel force. The early McDonnell Douglas F-4C Phantom II was earmarked for the role. This was the first TAC Phantom which retained many Navy features, TAC rapidly replaced it with the F-4D and gun equipped F-4E versions. The conversion of the F-4C involved fitting a Litton ALR-53 long-range homing receiver and coupling it to the ALR46. The ALR-46 was used to classify threats and the ALR-53 was used to pinpoint the position of the emitter for an attack. The converted aircraft were often referred to as EF-4Cs. The latter phase of the Vietnam conflict saw an increase in Wild Weasel activity as the Communists deployed further and newer equipment. Late models of the SA-2 and SA-3 SAMs were apparently operated at frequencies above the receiver cutoff of the Weasels. In spite of this the Linebacker II campaign of 1972/ 73 broke the back of the North Vietnamese air defence system and the Wild Weasel strikes preceded most strike forces on the way in to the target and often covered them on the way out. Whether the radars were actually destroyed, their antennas blown off or they had been forced to shut down, disruption to the air defence network was achieved. By the end of the Vietnam conflict it was apparent that a new Weasel was required to replace the F-105Gs and F-4Cs. The new system had to be able to cope with a higher threat environment such as the European theatre, the F-4D airframe was envisaged as a good starting point. The Advanced Wild Weasel development program was initiated. The Yom Kippur War radically altered the program. The Israelis did not regard SAMs and radar directed AAA as a serious threat before 1973 and were rudely surprised by the Egyptian & Syrian mass deployment of Russian built hardware, particularly the low level SA-6 command link/semi-active radar guided SAM and the ZSU-23-4P quad 23mm AAA system. Tactics to deal with these systems effectively were eventually developed, but not before the quoted loss of around 100 Israeli fighter bombers, a large portion of these being A-4s and F-4Es. In fact, in the first afternoon of the conflict, air operations over the crucial Golan Heights region virtually were halted until urgent remedies could be introduced to counter the AAA and SAM threat. The overall loss rate of about 1 % is deceptive, initial loss rates were far greater particularly during close support missions. The mobile tracked SA-6 was the first of a new generation of Russian SAM systems aimed at denying battlefield airspace to close air support and interdiction aircraft. All of these systems were mobile and capable of keeping up with advancing armour and mechanised infantry, many of their radars employed continuous wave monopulse techniques which made them much more difficult to jam particularly during close-in attacks. TAC's success in busting North Vietnamese tanks (over 700 were employed by the NVA, many of these heavy T-54s) and heavy artillery (over 250 130mm pieces destroyed) using precision guided munitions had alerted the Russians to a major vulnerability and SAMs were seen as the answer (missileers can't be tempted to defect as MiG pilots can). Clearly the density of Russian radar directed weapons was on the increase with a future outlook toward quite sophisticated frequency agile systems with optical backup to deal with heavy jamming. These circumstances indicated that the new Advanced Wild Weasel would have to be capable of agile manoeuvring at low level to evade fighters and surface defences while delivering its air to ground weapons. Its RHAW would have to cover a wider range of radar frequencies and pulse parameters while offering the accuracy to carry out blind attacks with conventional munitions. The fire control system would have to be carefully integrated with the RHAW to accept newer types of munition as these are developed. One of the first steps taken by the USAF following Yom Kippur was dropping the F-4D airframe for the new Weasel - an F-4D had been used as a testbed for the development of the weapon system. The F-4E airframe offered more internal fuel capacity, more powerful J79-GE-17 engines, a newer APO-120 fire control radar and wing slats which substantially improved turning performance. The USAF nominated the 1969-vintage Block 41 F-4E as the baseline airframe for the new Weasel and the designation EF-4E was adopted for the 116 conversions, this was subsequently changed to F-4G in view of the extent of the modification. The first F-4G flew in 1975, the first operational aircraft was delivered in 1978. The F-4E to F-4G conversion involves several airframe and a multitude of system changes. Most of these fall out of the installation of the APR-38 RHAW system, which physically displaces the F-4E's M-61 A1 20mm gatling gun. McDonnell Douglas engineers had to redesign the chin pod and various parts of the nose internal structure to accommodate 25 Line Replaceable Units (LRUs = 'black boxes') associated with the RHAW and support the chin RHAW radome. RHAW antennas number a total of 52 and may be found on the exterior of the chin pod, forward of the cockpit and on top of the fuselage and vertical stabiliser. Placement was chosen to provide near spherical signal coverage allowing all aspect detection of threats. Another change associated with the RHAW was the 'missionised' aft cockpit which received an array of dedicated screens for the EWO. Minor changes occurred to the forward cockpit. Modifications not associated with the RHAW were fewer. The centreline hardpoint was modified to carry an F-15 style 600g1 fuel tank allowing the F-4G a 6G manoeuvre capability when the tank is full and up to airframe limit when empty. This frees up both inboard and outboard wing stations for the carriage of weapons. The F-4G is wired to carry the AIM-7F and later AIM-9s, though the former is often displaced by a self protection jammer pod in the forward port well. Sidewinders may be carried subject to the type of ordnance on the inboard pylons. The F-4G may launch the AGM-65A/B/D Maverick missile and commonly carries Mk.82 500 pounders or CBU-52 cluster bombs. Shrike and Standard ARMs are supported and with a software fix and new launch rail the new NWC/TI AGM-88A Highspeed ARM (HARM) may be carried. A significant but relatively cheap modification to the basic airframe involved the fitting of smokeless J79-GE-17E engines rated at 11,870lb dry and 17,900lb in reheat, eliminating the characteristic smoke trail of other F-4 versions. This makes life more difficult for missileers using optical trackers. The '38 RHAW is the heart of the F-4G weapon system and also represents most of the US$2.8 million (in 1978 dollars) cost of the G upgrade. Initially developed by IBM Federal Systems under the TAC Pave Strike program the APR-38 is structured about a TI general purpose computer, a Loral control indicator set and several IBM receiver sets. The receiver arrays are the eyes of the RHAW, detecting radar signals as they impinge upon the aircraft. The most prominent are the forward/port/starboard mid-high band dual phased interferometer arrays situated under dielectric panels at the front of the chin pod. Together with a fourth aft facing unit in the fin pod these 9" arrays provide highly accurate azimuth information on any source which illuminates them (the interferometers compare the relative phase of a particular signal component at several physical points). Low band emitters are accommodated with a set of antennas, port and starboard, below the windscreen and at the front of the tail pod. Further omnidirectional antennas are fitted on the spine and beneath the chin pod. Signals from these antennas are fed into specialised receivers which under the control of the pod situated homing and warning computer are sorted and identified. The data is then passed from the chin pod via a dedicated interface to the Loral display set. The RHAW is integrated with the aircraft's air data, inertial and fire control systems and generates a comprehensive picture of the aircraft relative to its surrounding (threat) environment. The RHAW software will automatically prioritise all threats and can display the 15 (10, 5, 1) highest priority threats. The threat library is fully software programmable. Once a threat is designated and a weapon selected, the RHAW will compute and display a dynamic 'footprint' for the weapon to assist the crew, the RHAW can 'remember' threats so that the F-4G can make full use of terrain masking while moving in for the kill. Blind bombing, diving, tossing and level lay-down modes are available for given munition types. The RHAW system software has been optimised to provide the most critical threat information in as short a time as possible, though apparently software updates have been introduced quite often. Significantly the ability to monitor multiple threats allows rapid re-attack of targets in the immediate area while also easing the task of selecting a safe escape route. The APR-38 also contains a high speed tape recorder for logging digital data on mission parameters with time and voice included, this feature is used for post flight analysis. The ability of the '38 to analyse radar emissions typically from a standoff position allows its use both for strike coordination and reconnaisance. The specialised role of the F-4G becomes very apparent upon examining the pilot's and EWO's stations. The front cockpit retains most of the F-4E's instrumentation but a warning and control panel has been added together with a plan position indicator (PPI) scope which repeats range and azimuth data from the EWO's display. The lead computing gunsight has been modified to accept inputs from the RHAW: the red reticle indicates the location of the designated emitter while the green cross is caged in elevation to radar boresight and in azimuth to aircraft ground track. Blind bombing is carried out by steering the cross onto the reticle, depressing the bomb button and initiating a pull up. The fire control system times the release of the ordnance. The EWO's station differs considerably from a standard F-4E. The APQ-120 radar scope is retained. The instrument panel is enlarged, almost up to the canopy frame, with all flight instruments laid out horizontally across the top. These include the attitude, airspeed, altimeter and some navigation displays. The three APR-38 displays are arranged beneath these. The large rectangular PPI scope display is to the left, the smaller panoramic/analysis scope is in the centre and the small homing and attack display is at the upper right. The PPI scope will display up to 15 of the highest priority threats. Symbols are used; 'A' for AAA sites, 3 for SA-3 and emitter band designation eg J for unknown threats. Threats are designated by the EWO with a diamond shaped cursor over the threat symbol. Threat range, bearing and aircraft magnetic heading are then displayed, if a weapon is selected a footprint display may also be presented. In combat the F-4G will drop to a very low altitude as it approaches the target area to avoid detection visually or by radar. Hills and even tree lines may be used with the aircraft popping up only to update the RHAW with hostile emissions. Airspeed is kept at a maximum. In a typical Shrike attack the F-4G will close within range, then pull up at 4.5G, roll inverted, pull 5G and launch. The F-4G will then roll upright and dive either for a bombing run or escape. In the former case the Shrike forces one way or another a shutdown which allows the aircraft to move in for a bombing run usually employing CBUs which are quite effective against soft targets. Shrike has limited range at 5nm and the required launch manoeuvre thus can leave the aircraft in a relatively vulnerable position. The introduction of the new NWC/TI AGM-88A HARM as the Weasels' primary weapon will change this. The 800lb Navy HARM was developed at China Lake in the early seventies and employed several major improvements over Shrike. It uses a broadband (4 octave) receiver and all processing is under software control. It also has 10nm of range, higher speed, a smokeless rocket motor and a bigger warhead. HARM has three basic operating modes: in Self Protect it locks onto a RHAW designated threat, in Seeker-Search it will autonomously search for threats and in Pre-Brief it will climb after launch to search for threats which were loaded into its memory by the RHAW prior to launch. The latter capabilities are a major gain to Weasel operations as the F-4Gs can spend more time in the weeds. HARM's seeker can detect threats outside of the frequency range of the APR-38. Where an ARM launch has forced a shutdown, the AGM-65 Maverick electro-optically guided missile may be used to avoid overflight. The new Imaging Infrared D version has the ability to lock onto the residual heat signature of a radar set after it is turned off (it is physically impossible to dump all of the heat out of the system in the few seconds available) and the Weasels would use the RHAW to cue Maverick on target. The large amount of vacuum tube electronics in the Russian inventory eases the task; with a good IR source, Maverick may be used up to its 14nm aerodynamic range limit by day or night. 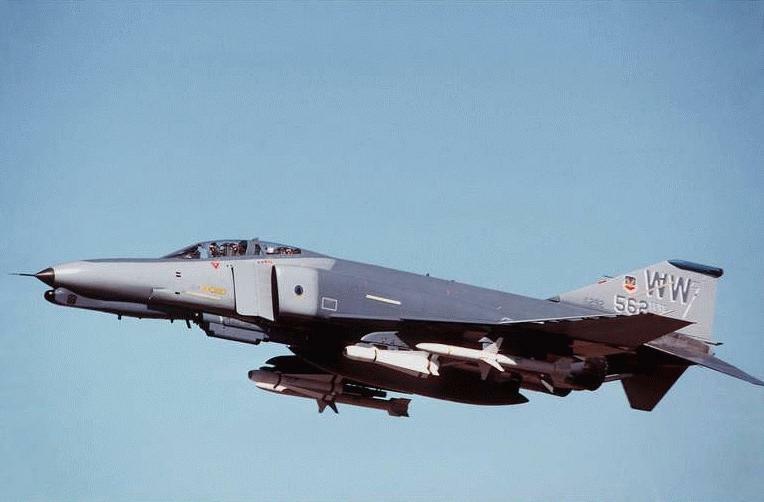 The F-4G can carry ALQ-119-12, 14 and ALQ-131 self protection jammers and ALE-40 chaff/flare pods the latter on the MAU12 pylons. The jammers are often turned off so as not to interfere with the RHAW. The European theatre is seen as the primary operating area for the Weasel force, which has come under pressure with further Russian deployments of the SA-8 Gecko, SA-9 Gaskin and new SA-13. Unlike the earlier SA-4 and SA-6 which used separate radar and launcher vehicles, these newer types carry radars on the launch vehicle (though some are range only) which greatly increases the number of emitters to be suppressed. The USAFE's major move has been the 1984 restructuring of the Weasel force: a Weasel squadron now consists of 8 F-4Gs and 16 F-4Es. Strikes are flown with 1 F-4G and 2 F-4Es in a hunter-killer arrangement. Some F-4Es have been refitted with the 600 gal tank and moves are under way to have them fitted with HARM command launch computers. The F-4G aircraft will also be fitted with the AN-ARN-101 mission computer common to the F-4Es, a computer-to-computer datalink is envisaged for target handoff. TAC has also ordered 18 attrition F-4Gs to restore the 96 strong combat force to full strength. A further step has been the forming of the 65th Air Division controlling both the 52nd Tactical Fighter Wing (Wild Weasel) at Spangdahlem and the 42nd Electronic Combat Squadron (EF-111 A) at Upper Heyford, England. The present F-4G aircraft are also due for a major upgrade under the F-4G Performance Update Program which will see the RHAW upgraded to AN/APR-45 configuration. IOC is set for 1988, the new computer/receiver system will provide 5 times the computer power, 8 times the memory, a tenfold increase in data processing speed and simultaneous narrow/wideband coverage. Given the number of defence suppression missions flown in Vietnam, the Yom Kippur War and more recently over the Bekaa Valley it is surprising that air forces other than the USAF and Israeli AF have taken so long to respond. 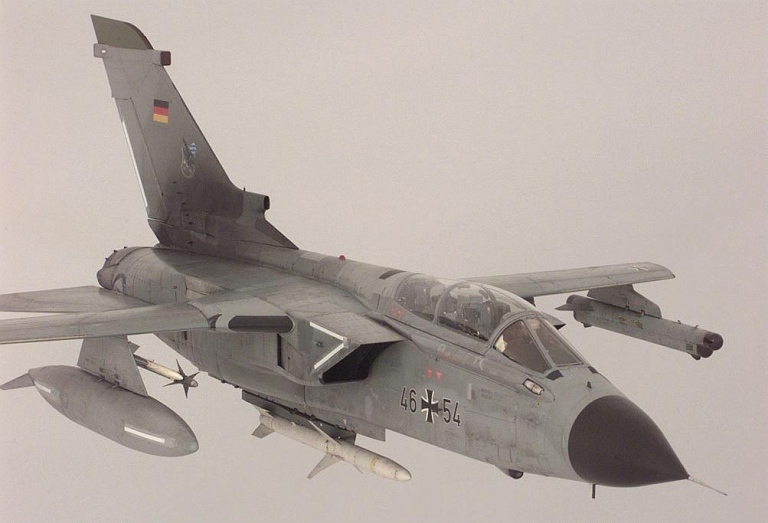 The UK's development of the Alarm ARM and Germany's HARM equipped Electronic Combat Tornado (40 aircraft) are both steps in the right direction. Unfortunately given budget limitations, the RAAF is unlikely to acquire specialised defence suppression aircraft and can be expected to follow the US Navy and fit HARM to the F-18A. The stunning success of the Bekaa Valley strikes and even that of the recent round one USN shootout with Libya demonstrate that active defence suppression is the optimal path. If Ivan ever decides to expand his empire westward, the Wild Weasels will be waiting.